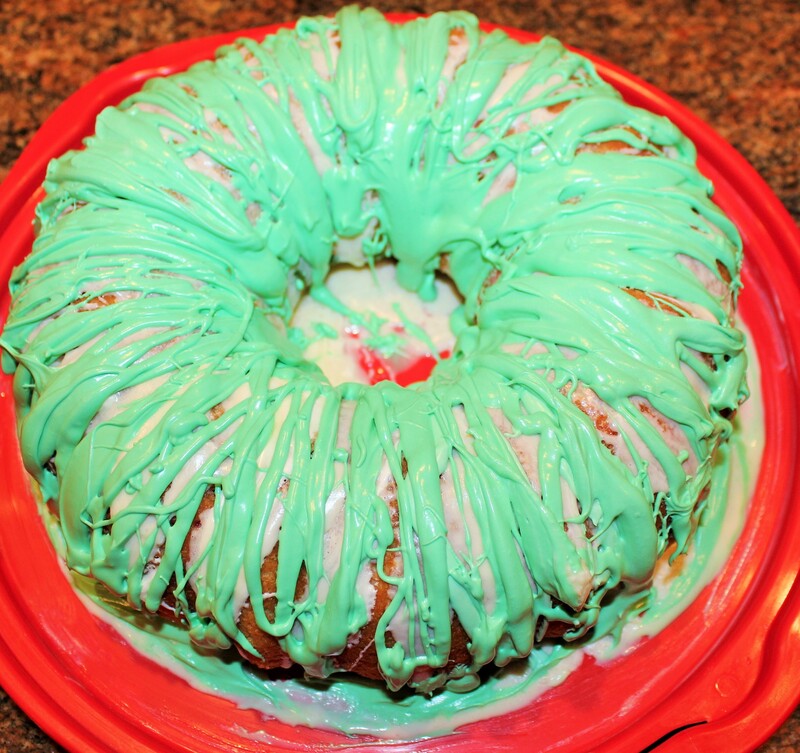 I recently saw this festive Christmas-y bundt cake on Pinterest and knew I would have to give it a try, if for nothing else than to wow the kids. I did a Google search for it and found a number of different recipes (plus you can adapt it to other holidays as well, such as Halloween or Fourth of July.) And wow the kids it did — young and old alike! 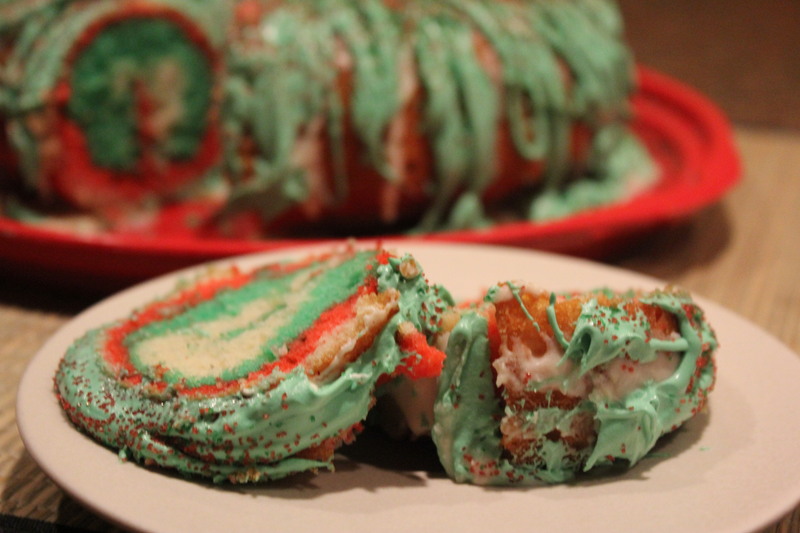 I guarantee you will get a number of “ooohs and aaaahs” if you make this for a holiday get-together. Instead of making my own batter or icing, I used the store-bought mixes since it was my first attempt, and I must say it tasted pretty good and was certainly moist. 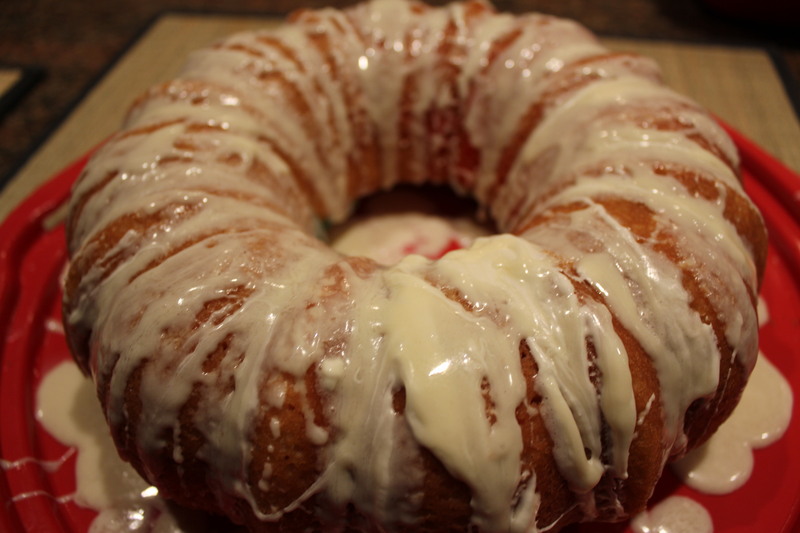 Since there are a few extra steps involved making this versus an ordinary bundt cake, you have my permission to use the store-bought stuff as well. And this time of year, lots of cake mixes and icings are on sale, so take advantage of that, too. 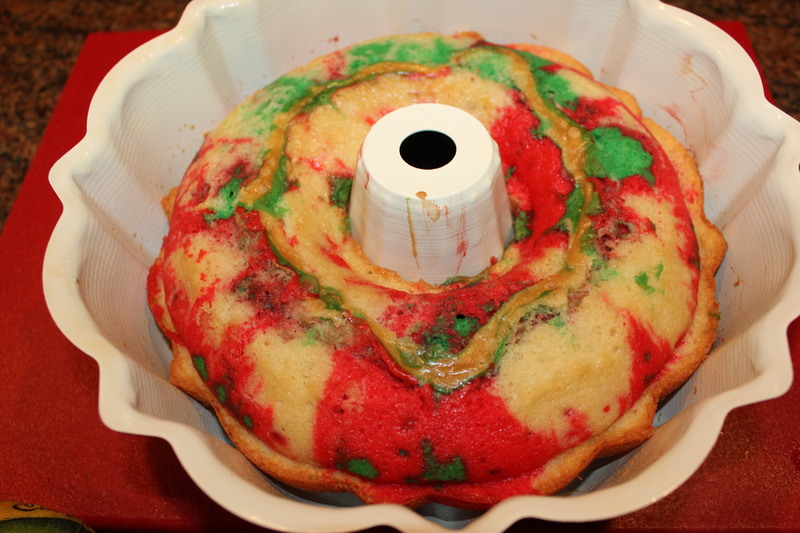 Heat oven to 325 degrees F. Spray a bundt pan with the baking spray. 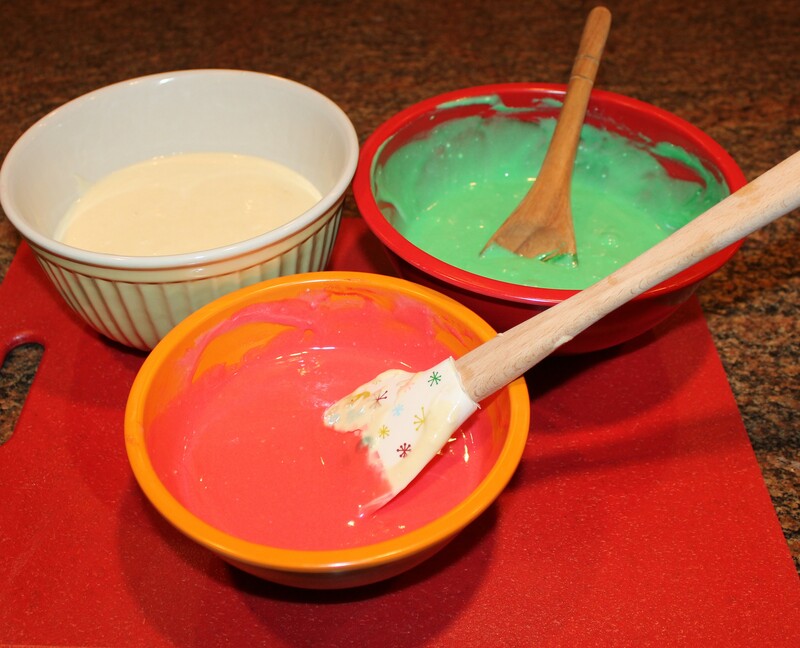 Add some green food coloring to one of the smaller bowls of batter and red food coloring to the other small bowl. If you get any food coloring on you, wash it off fast — that stuff will stain your fingers! 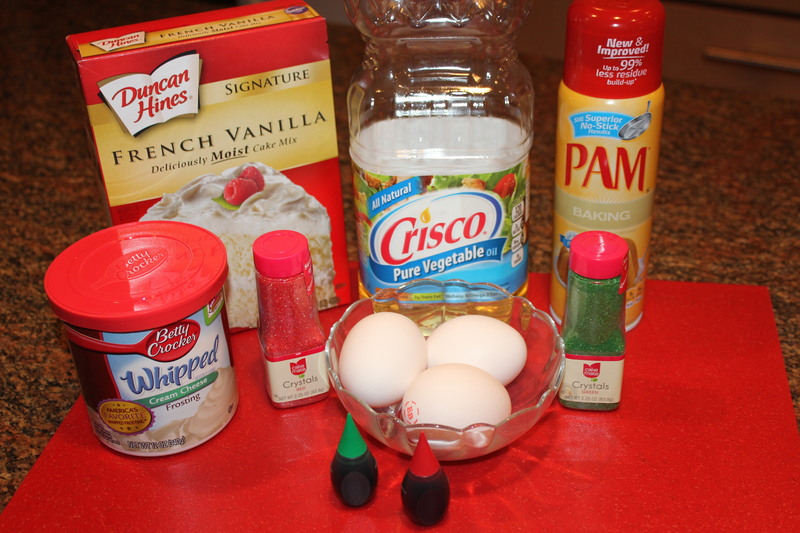 Take one cup of the plain white batter and place it in the bundt pan. 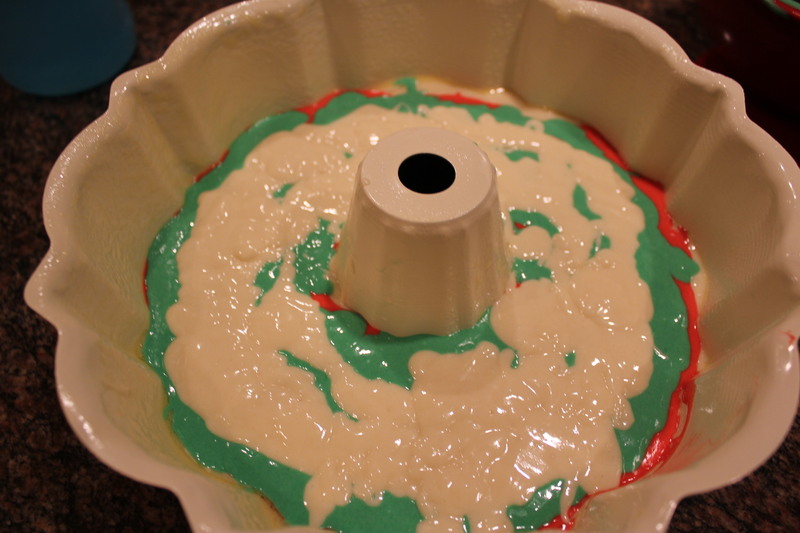 Carefully pour the red batter over that and then pour the green batter (only some of it is pictured directly below) over the red batter. Finally, top with the remaining white batter. Do not mix the colors — just leave them however they poured into the pan. Bake according to the cake-mix box instructions, or until it passes the come-out-of-the-middle-clean-toothpick test. Cool 5 to 10 minutes, remove from pan and place on a wire rack until the cake has completely cooled (30 minutes or so). Once the cake has cooled, equally divide the frosting between two bowls. Microwave one of the bowls for 10 seconds or so, stir well and then drizzle the white frosting over the cake in a striping pattern until all of the frosting has been used. 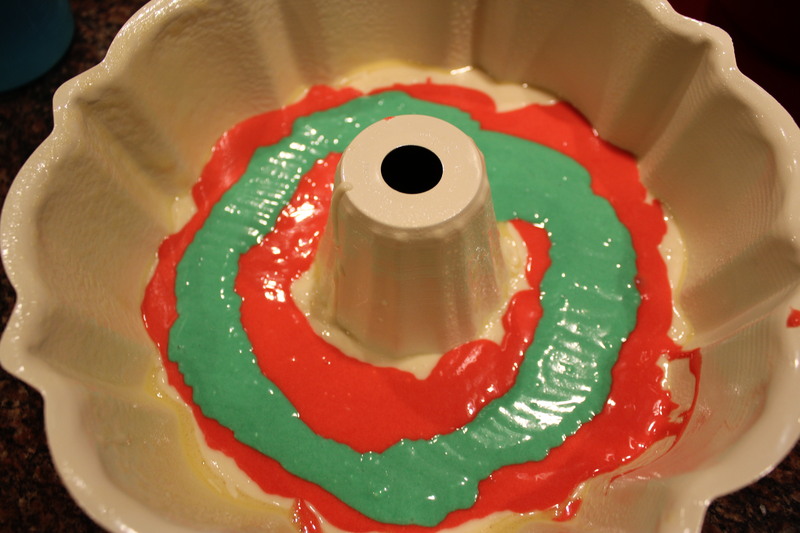 Microwave the other bowl of frosting for 10 seconds, add some of the green food coloring, stir well, and then drizzle it all over the cake, again in a striping pattern until that frosting has been used. 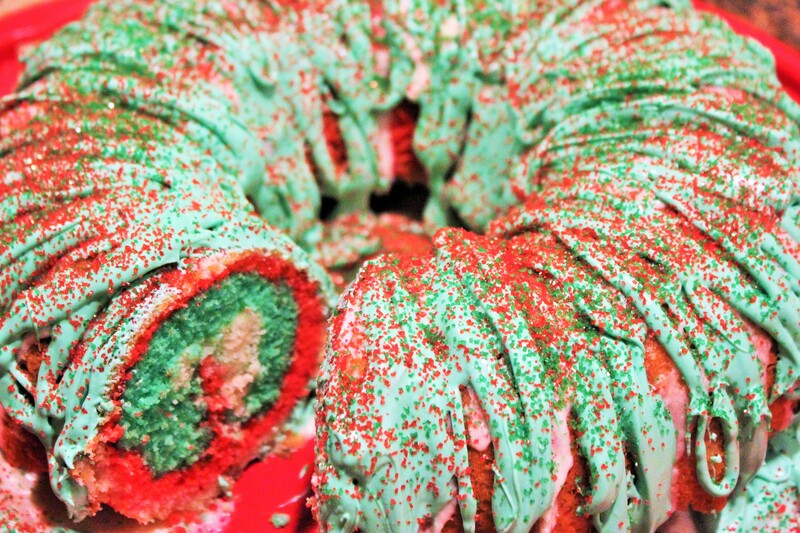 Top with the red and green sprinkles. 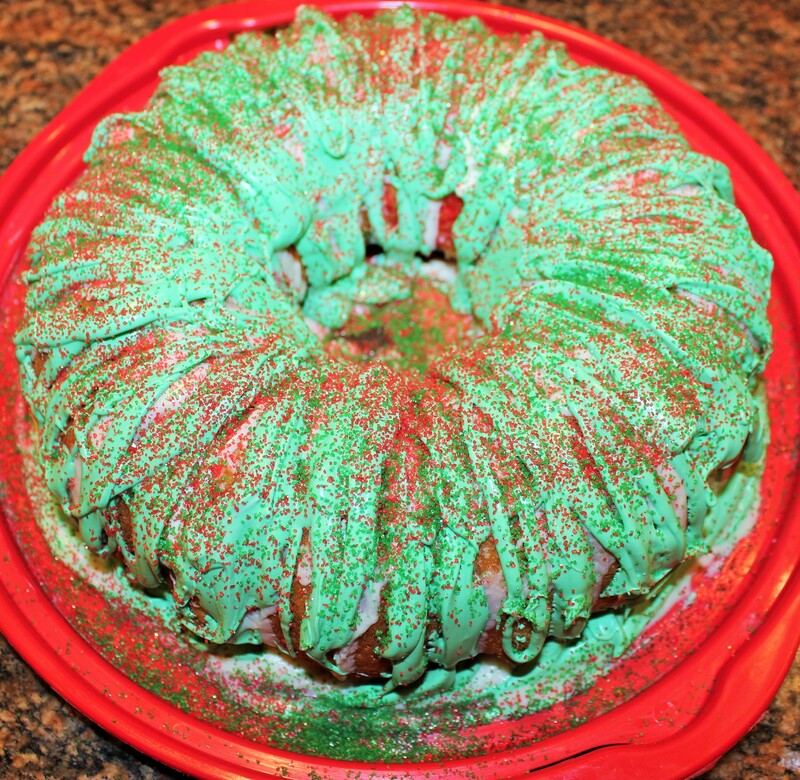 This entry was posted in Desserts, Recipes and tagged Christmas bundt cake recipe, eat drink and be merry, Festive holiday bundt cake recipe, Kel's Cafe cake recipes, Kelley Chisholm recipes, red and green bundt cake recipe. Bookmark the permalink.